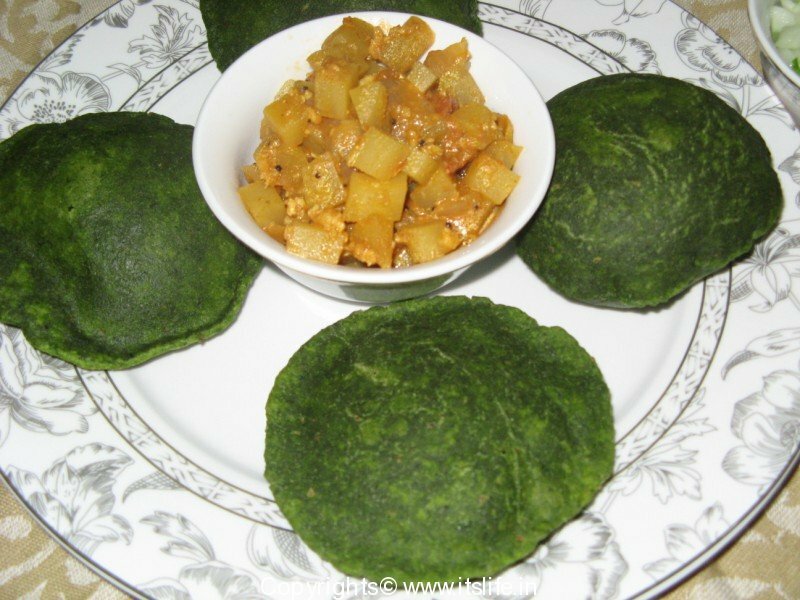 Palak Poori is deep fried fluffy bread prepared using Spinach. 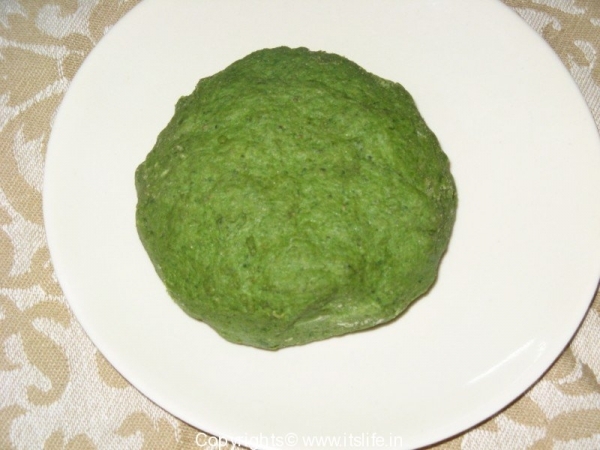 Popeye the sailor man….will love this Poori! Remove the stems of the leaves and wash. Boil water and blanch Spinach leaves. Strain and let it cool. 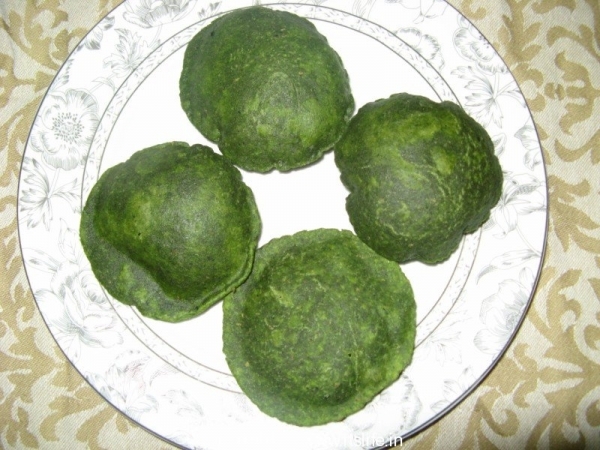 Puree Spinach. 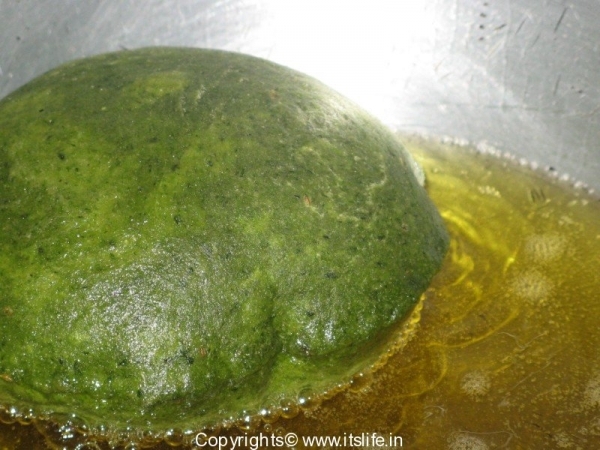 In a mixing bowl add Wheat Flour, Palak Puree, Salt, Ajwain Seeds and water and knead to a dough. Divide the dough into lemon sized balls. Heat Oil in a pan. Roll out the balls thinly on a greased surface to concentric circles. Drop them in Oil and within 2 seconds tip it over. As ever, I have to remind you to be careful when cooking with oil. You want to take care that you don’t hurt yourself or start a fire and end up bumping up next years buildings insurance quote! Fry until light brown and remove on kitchen towels. 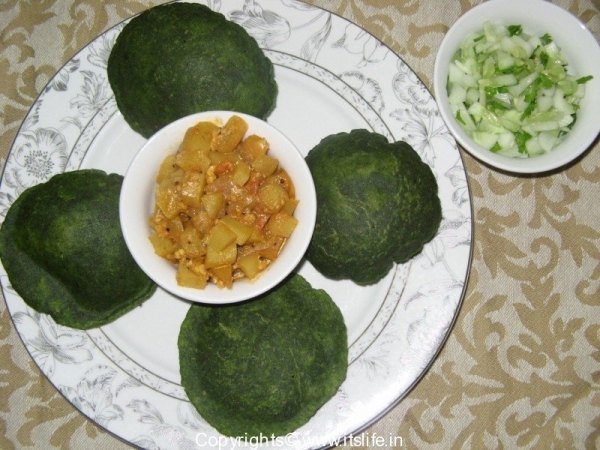 Serve Palak Poori with your choice of side dish. Wow… what a lovely green color. it has puffed nicely. Thanks for visiting. Just after blanching palak, if you run cold water on it, it retains its color. Another hint to make the pooris puff up is to hold down the Poori in the oil for a few seconds using a flat spoon and leave it. The pooris floats to the top puffed up.